Earnest Ray Campbell, age 83, beloved husband, father, grandfather and great-grandfather, a long-time resident of Golden Shores, Ariz. passed away on Saturday, February 24, 2018. He was born February 26, 1934 in Handley, Texas. He was an owner of a very successful California based construction company and was known for his craftsmanship of commercial buildings, custom and tract homes. In 1963, he started visiting Golden Shores and eventually became a full-time resident in 1974. 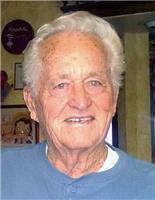 Earnest helped build and establish the first fire department in the town of Golden Shores. He also helped build the first Community Baptist Church and many other community projects. Earnest has been known for his kind and caring heart. He loved his entire family dearly and he will be terribly missed. He is preceded in death by his first wife, Mattie LaVada Campbell of Texas; son, Robert Campbell of California; parents, Virgil and Dorothy Campbell; sisters, Margaret and Maxine; brother, Fred, all of Texas; and his son in love, George Binkney. He is survived by his wife Betty of 49 years; daughters, Deborah Binkney and Lovetta (Doyle) Ward; step-sons, Raymond (Tonya) Balli, Tyler Balli; daughter-in-law, Teresa Campbell; grandchildren, April Barnes, Brian Binkney, Darrell Binkney, Earnest Binkney, James Campbell, Jason Ward, Jennifer Morrow, Mattingly Balli, and Nick Balli. Earnest is also survived by 14 great-grand- children and many nieces and nephews. Funeral service will be held at 11am on Monday, March 12, 2018 at Golden Shores Community Baptist Church, 5084 E. Cibola Drive Topock, Ariz.
Interment to follow at Desert Lawn Cemetery 9250 S. Ranchero Ln, Mohave Valley, Ariz.
Celebration of Life will be held at Golden Shores Fire Department 12950 Oatman-Topock Hwy, Topock, Ariz.